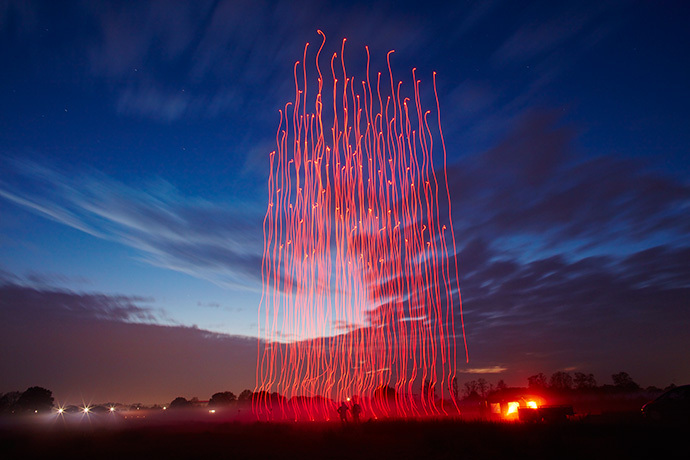 One hundred drones take to the air over Tornesch, Germany, on the evening of Nov. 4, 2015, to create Drone 100. Intel has received the Part 107 Certificate of Waiver from the Federal Aviation Administration. The waiver was posted today on the FAA’s website. The agency waived for Intel regulations regarding daylight operation and the operation of multiple small unmanned aircraft. Intel is authorized for operation of multiple small unmanned aircraft systems at night within special security notice flight restriction areas in the United States. This is an extension of the Section 333 Exemption that Intel received earlier this year to fly multiple aircraft in the United States for the company’s Drone 100 light show. This FAA waiver extends the capability for Intel in the US, to innovate beyond Drone 100 – to 100s and even 1,000s of drones in the future. Drone 100 is a demonstration of how Intel pushes boundaries and shows people an exciting new way to experience the wonders of drone technology. Intel has showcased Drone 100 globally – receiving the Guinness World Record for this innovative breakthrough. Intel has performed private shows with 100 drones flying in the night and at twilight in Germany and Palm Springs, California. Intel debuted the first public showcase of Drone 100 on five consecutive nights in Sydney where the drones took off from two barges in Farm Cove. The Australian events were witnessed by more than 100,000 spectators. Intel is looking forward to showcasing this technology and related light shows in the United States – expanding the technology and the number of the drones in the light show. Aside from showcasing creative expression, Drone 100 highlights the exciting future of UAVs, including the different ways they can be integrated into different industries. In the future, this technology can also be applied in other segments, from commercial to search and rescue uses to allowing for faster and more efficient operations and missions.